Throughout the Carnival period, Italians gorge on fatty treats, which traditionally they abstain from during the Lent period starting Ash Wednesday. 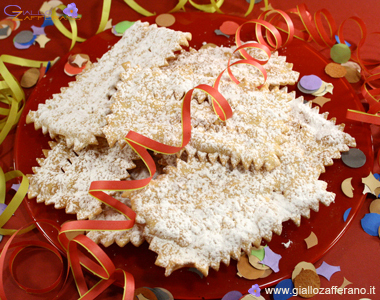 And one of the most popular Carnival treats are ‘Chiacchiere‘, which translates to chatter or gossip! They are crunchy, sweet strips which are deep fried until golden and dusted in icing sugar. They are simple to make and of course, delicious to eat. Sometimes they are dipped in chocolate for extra opulence! Mix together all the ingredients and knead well to make a soft dough. Add a tablespoon of water if necessary. Wrap in clingfilm and put it in the fridge to firm up for at least 30 minutes. Cut into 4 pieces, and work each piece individually through a pasta machine on the widest setting, then folding and putting through again, then resetting the pasta machine to a thinner setting, further reducing the setting until you have a long sheet of thin dough. If you do not have a pasta machine, use a rolling pin and roll out as thin as possible. Using a serrated cutting wheel, cut the dough into 1 inch by 5 inch strips. Heat a pan of oil (peanut or sunflower) until about 350°F (170-180° C), and drop in a few pieces of dough at a time. Turn with a spatula. Cook until golden, then drain on paper towels. Sprinkle with icing sugar, or if you are really celebrating, drizzle with melted dark chocolate.